Senior Expert Shawn Childs recaps the value, talent and opportunity and what to look for from Fantasy Football's backup WRs (ranked #37 to 72). Any WR that averages over 10 Fantasy points in PPR leagues will be viable as a starting WR4 in the FFWC. The goal is to find the best options that beat their expected value and become starting WRs. If you want to refresh the recent history on the targeted Fantasy points at WR3 and WR4, you have to look no further than this article. It would also be helpful to take a peek at the Fantasy points required to start at the flex position in PPR leagues in the Fantasy Football World Championships. Mike Williams will have a wide range of options in the early drafts season, which is highlighted by his high ADP of 46 and a low of 121. The Chargers have a high volume WR1, but they lack a reasonable option at TE with Hunter Henry out for the season, which points to a breakout season by Williams. I’ve seen multiple times in the early draft season where one of the top high-stakes owners (actually two owners paired together) picked off Mike well after round ten. At that level, Williams is a gift with the talent to post a WR2 season. Once he hits the preseason field, his value in drafts will soar forcing Fantasy owners to make a much more difficult decision. I view him as must-own while being a top WR4 talent even if have I have to draft him in the seventh round. At some draft positions, I may even have to draft him as a WR3. I would follow his draft value closing over the next month or so plus keep an eye on possible owners in your league that also have interest. Will Fuller has a nice combination of explosiveness and scoring ability. He plays for a developing QB who looked his way in the red zone over his brief starts in 2017. The biggest question with Fuller will be his ability to stay healthy. The Texans have a weakness as well at TE, which is a positive for Will to have further growth in 2018 if he can stay healthy for 16 games. I would rather buy his as a value than overpay. Fantasy owners have chased around DeVante Parker for his whole early career in the NFL. Even with a better path to targets, his price point still appears to be below his opportunity. With no Jarvis Landry on the roster, Parker can’t help but set career highs in catches, yards, TDs, and targets. An excellent option as a WR4 in PPR leagues in 2018. Randall Cobb plays for one of the best QBs in the game, but he’s struggled to create separation over the last three seasons, which leaves his impact season in 2014 (91/1287/12) a distant memory. The WR2 in the Packers’ offense is going to be productive, so Cobb can’t be overlooked as undervalued WR in this range. He’ll start the year at age 28 with plenty of life still in his game. Even if you don’t like his path or game, a Fantasy owner can’t be naïve on the breakout potential in a high touchdown offense in Green Bay. Age (33) isn’t on Jordy Nelson’s side, and he won’t have Aaron Rodgers throwing him the ball in anymore. His best asset tends to be his hands, but he still needs to create a bigger passing window downfield. His resume shows he’s done it before, but wide receivers can fade off into the sunset quickly if their legs have left the building. I’ll keep an open mind here while paying close attention to his preseason progress. Derek Carr has talent for sure, but Jordy won’t have the same opportunity in 2018 with the Raiders. Sterling Shepard will be the number two receiving option in New York. His opportunity in coverage will be helped by a healthy Odell Beckham and a viable option at TE. Last year as the WR1 in many games for the Giants, Shepard showed he had more explosiveness than expected. Sterling should be a nice steady WR4 with more upside with growth in New York’s passing game. Robby Anderson looks to be cleared from his off the field issue by the law, but he may get the hammer laid on him by the NFL leading to some missed games. He had a great run midseason in 2017 suggesting his game has more upside. I don’t like the Jets’ offense, and the QB position remains in flux. I’d rather shop in this area for a WR on a team with a high ceiling in scoring ability. My gut tells me to avoid Marquise Goodwin as he has an injury history, and he won’t be the top WR on the roster in 2018 with a healthy Pierre Garcon on the field. Goodwin falls into my bust category in 2018. Both Allen Hurns. Marqise Lee and Nelson Agholor play in offenses with depth or similar options at WR, which make them tougher to trust from week to week. Agholor plays in a high scoring passing offense, so I would choose him over Hurns if given that decision. Hurns may surprise while being more of a value in some drafts, which puts him in play if he drifts into the WR5 range. Kelvin Benjamin played great in his rookie season (73/1008/9), but injuries have caught up to him over the last two seasons. The downgrade to the Bills’ offense takes the shine off his game even though his opportunity should rebound in 2018 with a healthy season. Let’s just say I won’t fight for him in 2018 with Buffalo expected to have regression offensively. The upside swing at WR comes in the WR5 grouping. Three 2018 rookies are listed with each player having a reasonable opportunity to start and offer upside. If you want to see each of these player’s profiles, they can be found on each team’s outlook page. Let’s just say; I like Anthony Miller this best of the three rookies listed here. I listed Kenny Golladay as potential breakout player due to his scoring ability and one season of experience in the NFL. He’ll start the year at the WR3 for the Lions, but he may need an injury to become a Fantasy starter. Kenny Stills may be the player that set the floor at WR5 as he should have a nice step up in targets while battling DeVante Parker for top WR spot in Miami. If you’re looking for a playable option out of the gate or a player for bye weeks, Stills should have the highest floor entering the season. Dez Bryant is mispriced, but Fantasy owners still need to see where he lands to gauge his starting opportunity. With each day that passes in training camp, Dez falls a step behind in conditioning and learning a new playbook. Both Josh Doctson and Tyler Lockett have big-play ability while failing to fill the high volume catch bucket. I would rather own an incoming rookie on this list than both options. Martavis Bryant has a lot prove after a failed 2017 season. He has possible suspension looming while starting the year as the WR3 for the Raiders. He owns me plenty of bucks from last year, but I’m cutting my losses. Donte Moncrief lost his luster for me. He has too many WR options to compete with to deliver starting WR stats. His game has never lived up to his expected value. The WR I like best in this group in Jordan Matthews. He has three seasons on his resume with 65 catches or more and two years with eight TDs. He’ll emerge as the WR2 in New England with a Wr1 opportunity over the first four weeks with Julian Edelman suspended. In a way, he could be a nice handcuff for Edelman due to his price point. I expect Matthews to post a top 36 season if he plays a full 16 games. His injuries over the last two years do invite failure risk, which is priced into his draft value. Of the four players I’ve listed with upside, I like Michael Gallup the most. He has an excellent chance of starting, but the Cowboys will spread the ball out to their top four WRs. The lack of a viable TE does work in his favor. Christian Kirk may develop into a high volume receiver, but he needs to play in the slot. With Larry Fitzgerald manning that position, I would be less inclined to chase Kirk on draft day. His price point is more than fair while still having questionable value in his playable opportunity. Danny Amendola is a volume type WR, but a heavy workload will invite injury risk. The Patriots did a nice job keeping him healthy last year. I fear the Dolphins view him like a new toy and a flash start to the year will result in a season-ending injury. Dede Westbrook was outplayed by Keelan Cole last year, and they may be the case again in 2018. Westbrook lacks size (6’0” and 178 lbs. ), which puts him in the big-play role in the Jaguars’ offense. He will develop over time, but he projects as flash WR in 2018 leading to some big games and many short scores. Chris Godwin needs an injury to gain more chances. He may have value at times in 2018, but Tampa has too many options at WR and TE him for him to be trusted as a week-to-week starter. Remember, in Fantasy football, a player’s draft value can change on a dime. A Fantasy owner can love a player in July based on his ADP. Six weeks later in the live draft season in Vegas, that same player could jump eight to ten rounds making him a player to avoid based on comparable options at his new price point. After reviewing the top 72 WRs, a Fantasy owner should have a good feel for early draft flow and potential opportunities. Your next step is fine-tuning your draft decisions while being on the clock at Fantasy Football World Championship. Here’s the link to the Draft Lobby. 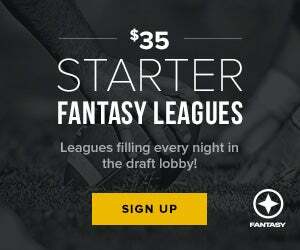 Are you a Die-Hard Fantasy Football Player? CLICK HERE to Start Your Road to the 2018 Fantasy Football World Championships.